Jump City is a family owned and operated bounce house facility. 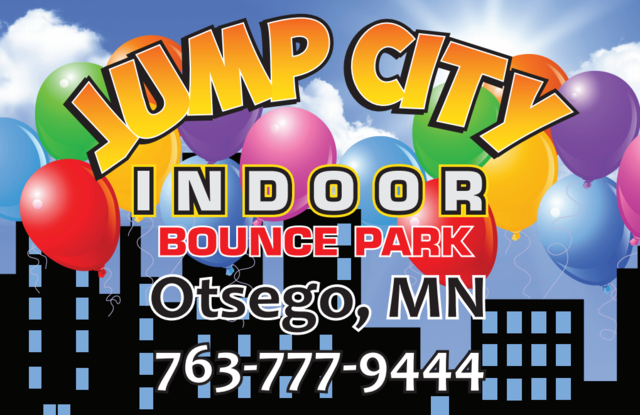 We offer open jump (walk ins), private and non-private parties, and off site inflatable rentals in Minnesota. Birthday Parties - When you book your party with us we make a promise with you that your event will be extra special. One of our team members will be able to assist you all along the way throughout your party. Check out our party packages to see what we can do for you! Bounce House Rentals in MN - When you are hosting a party, you want to make sure it is perfect! That's why here at Jump City we do everything we can to make sure your equipment shows up on time and clean! With our hard working staff and years of experience we can ensure you that your kids will have a blast of endless fun! We are now providing FREE delivery and set up of bounce house rentals in Minneapolis MN and to the entire Minneapolis and St.Paul Metro Area. Open Jump - Showing up at open jump to your kids is like showing up to a never ending fun! There is no limit on how long you can stay and with how often we change out the inflatables it will never get boring. Our inflatables and play area is cleaned daily so you and your kids can relax and enjoy your time together! This location offers a great family environment and is very clean. We love the fact that it has a great viewing area for the parents and that it entertains the kids well, my daughter is eight and my son is one. My daughter loves the fact that they change the bounce houses so that it is not the same setup every time she goes. Just make sure you check the website to confirm open jump time s as it tends to vary due to parties that are set up. the owner is very pleasant and courteous towards the customer satisfaction which is fantastic. Great indoor play option for kids! Its clean, staff is nice and the price is reasonable. They change up the indoor bounce attractions periodically too. So it wasn't the same as the time we were there before.